Peter Pan Day! Saturday July 23rd! at their Annual Pirate Party this Saturday, July 23rd! Peter Pan will always hold a special place in my heart. Our twins went through a time where they were just so captivated by the magic and wonder of the characters, pirates and Neverland! 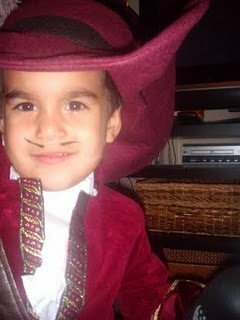 They dressed up as Captain Hook and John for Halloween (and many other days), they saw the play at the Woodlawn Theatre, Disney on Ice had a great Peter Pan segment at the same time, and every playground was a pirate ship! Although the kids have moved on a bit to super heroes and power rangers, the love of Peter Pan is still lingering. They love Disney Junior's "Jake and the Neverland Pirates", dress up and the awesome playroom their grandma made them, hand-painted with the Peter Pan theme. And thanks to the Twig Bookstore, I get to squeeze out a little bit more. They will "Celebrate Peter Pan" day with their Annual Pirate Party, this coming Saturday morning at 10:30 a.m. It will be our first pirate party, but the Twig says to wear your costume, for story time, a treasure hunt and pirate fun! Check out their website here for more details! You can also read about our trip to the Twig to see Olivia the piglet here!